eToro: The Commodity.com Review. Is It the Right CFD Broker For You? Warning: All trading involves risk. Only risk capital you're prepared to lose. eToro established the first social trading platform, and in doing so disrupted the conservative online brokerage industry. Investors in stocks, indices, precious metals, commodities, ETFs, forex and cryptocurrencies can use eToro’s innovative investment platform and its CopyTrader feature to follow other traders, discuss trade ideas and even copy the successful trading strategies of other traders in the community. eToro’s groundbreaking social platform has earned it praise from industry watchers. In 2010, Money AM Online Finance Awards named it the Best Active Trading Platform. In 2011, the firm received the World Finance foreign exchange award for best mobile trading platform and best software provider. In 2012, the Share Awards honored the company for best use of social media, and in 2013, eToro received Best Trading Platform at the Star Awards. The 2013 FinTech 50 listed the company as one of the game-changing technologies across Europe. For a new generation of traders who want to incorporate a social community into their online trading platform, eToro is the ideal solution. This eToro review will provide an overview of the company and discuss the major features of the platform. What Could eToro Do Better? Countries Served 60+ (Full list below). Fees Spread + Overnight fees(Full list below) . $25 per withdrawal, inactivity fee after 12 months. Customer Support 24 hour support 5 days a week. No live chat though. 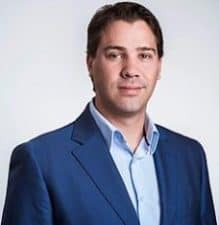 eToro was the brainchild of brothers Ronen and Yoni Assia, who founded the firm in 2007 along with their partner David Ring. The trio’s vision was to create a trading platform that appealed to a wide audience and was user-friendly. The concept proved very successful and eToro grew quickly. The firm now serves over 5 million users worldwide. eToro adds thousands of users daily and remains the premier social trading platform. eToro receives regulatory oversight in two jurisdictions – the United Kingdom and Cyprus. The company operates through London entity eToro UK Limited in the United Kingdom. eToro UK Limited is registered with the UK Financial Conduct Authority (FCA) and is compliant with the Markets in Financial Instruments Directive (MiFID). This compliance allows the firm to operate throughout the Eurozone. In Cyprus, the company operates through its entity eToro Europe Limited, which has headquarters in Limassol, Cyprus. The Cyprus Securities Exchange (CySEC) regulates the firm and requires it to maintain sufficient capital and segregate client accounts. eToro offers customers 24-hour support 5 days a week. Customers who need assistance can reach the company by local phone, fax or email. The eToro website supports several languages. eToro does not offer live chat support. eToro operates in over 60 countries. Regulatory conflicts prevent the company from doing business in the following countries: Iran, North Korea, Myanmar, Syria, Cuba, Sudan and the USA. Financial Conduct Authority (FCA) Austria, Belgium, Bulgaria, Croatia, Cyprus, Czech Republic, Denmark, Estonia, Finland, France, Germany, Gibraltar, Greece, Hungary, Iceland, Ireland, Italy, Latvia, Liechenstein, Lithuania, Luxembourg, Malta, The Netherlands, Norway, Poland, Portugal, Romania, Slovakia, Slovenia, Spain, Sweden, UK All client funds are held in a segregated client bank account Financial Services Compensation Scheme (FSCS) may cover up to £50,000 if eToro fails. Cyprus Securities Exchange (CySEC) Argentina, Australia, Bahrain, Brunei, Canada, Chile, China, Colombia, Egypt, India, Jordan, Kuwait, Mexico, Malaysia, New Zealand, Nigeria, Oman, Paraguay, Peru, Qatar, Russia, Saudi Arabia, Singapore, South Africa, Switzerland, Thailand, Ukraine, United Arab Emirates, Uruguay, Venezuela All client funds are held in a segregated client bank account The Investor Compensation Fund may provide up to €30,000 if eToro fails. The UK’s Financial Conduct Agency regulates eToro’s activities in the UK, but through the FCA’s “passport out” system (which enables an authorised firm to provide financial products or services, set up a base, or run its permitted activities in another country in the European Economic Area (EEA)) the FCA also covers their activities in Ireland and Germany. The fact that eToro is regulated by the FCA is a huge positive. The FCA and the UK is widely respected as a leader in financial regulation and in fact the UK scores highly in Transparency International‘s rankings of countries based on their corruption perceptions index meaning the UK is a pillar of anti-corruption. eToro customers in the countries listed above are protected by the UK based scheme Financial Services Compensation Scheme (FSCS) which was established to protect consumers when authorised financial services firms fail. In short, it steps in and pays compensation up to certain levels if a regulated firm is unable to pay. Up to £50k of funds deposited into eToro are protected by the FSCS if you are in one of countries that fall under the FCA jurisdiction. For more information, EToro’s Financial Services Register reference number is FRN 583263. The Cyprus Securities and Exchange Commission is the financial regulatory agency of Cyprus. Cyprus is a European Union member and is a financial services industry hub. The country ranks well in the Transparency International league table of countries based on their corruption perception index. This is reassuring if you’re in a country where your eToro activities are regulated by CySEC, although obviously it is worth remembering that the level of compensation available (up to €20,000 if eToro fails) is less than if you are in a country that falls under the jurisdiction of the FCA. The company’s CySEC license number is 109/10. For more information, you can inspect eToro’s CySEC membership details here. eToro uses SSL encryption technology to protect its users from cybersecurity attacks. In addition, the firm never shares its clients’ information with outside parties without first obtaining their permission. CEO Yoni holds a B. Sc. in Computer Science and Management and an MSC in Computer Sciences. 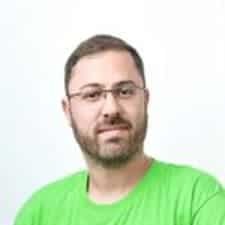 Board Member Ronen heads up product direction for eToro and holds a B. Des. in industrial design and an M.A. in design. 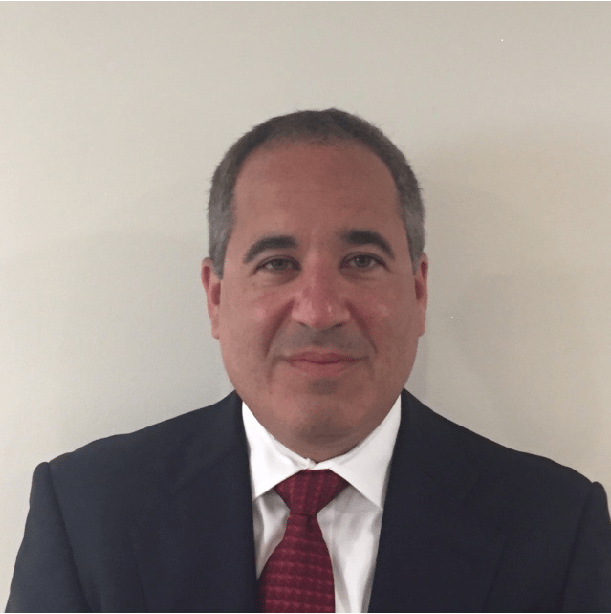 Board Member Santo is a founder and General Partner of venture capital firm Sparks Capital. He holds an MBA in finance from the Wharton School at the University of Pennsylvania, an MS in electrical engineering from NJIT, A BS in electrical engineering and a BS in physics from Bogazici University in Istanbul. 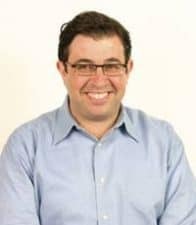 Board Member Avner is the former CEO of Meitav Dash Investments Ltd., which is the 2 nd largest investment house in Israel. 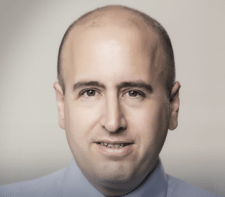 He holds an MBA from Tel Aviv University and the Northwestern University Kellogg-Recanati International Executive Program. Cryptocurrencies trade as contracts for difference (CFDs) on the eToro platform. Rather than holding the cryptocurrency in a wallet, traders receive the difference between the price of the cryptocurrency at the time of purchase and its current price. Therefore, traders can speculate on the price of cryptocurrencies without the cybersecurity and regulatory risks. The eToro platform offers trading on 47 different currency pairs. 76% of retail trader accounts lose money when trading CFDs with this provider. You should consider whether you can afford to take the high risk of losing your money. Traders can use one of two different eToro account types – a standard trading account for trading with real money and a demo account, which uses virtual funds to place practice trades. Traders can open a standard trading account with anywhere between $50 and $10,000. The eToro standard trading account offers traders various leverage limitations based on the product being traded. For example, major currency pairs (30:1), non-major currency pairs (20:1), commodities except for gold and non-major equity indices (10:1), CFD stocks (5:1), and cryptocurrency CFDs (2:1). eToro reserves the right to limit the amount of leverage a trader can use to reduce its overall market exposure. eToro strictly enforces its margin requirements to ensure that the firm remains solvent. When a trader’s cash equity approaches the eToro margin requirements for the account, eToro will alert the customer that they are approaching a margin call. If the cash equity falls below the eToro margin requirement, eToro will initiate a margin call and close the trader’s open positions. Traders who sign up for an eToro demo account receive $100,000 in virtual currency to trade. Traders can test their strategies by executing practice trades in real time. The eToro demo account also allows traders to test the functions of the platform before committing real money to trades. In addition, traders who follow Sharia law can open Islamic accounts. These accounts don’t utilize swaps in accordance with Sharia law. Indicative prices; current market price is shown on the eToro trading platform. This overnight eToro fee (or credit) is either added to or subtracted from a trader’s account when a position remains open past a certain period of time. The eToro overnight fees charged are multiplied by three if a trader holds a position over Wednesday night. Overnight fees are charged to customer accounts and credits are applied at 17:00 New York time. eToro does not charge overnight fees for non-leveraged buy positions. eToro charges traders a $5 inactivity fee if traders don’t use the platform for a period of 12 months. This eToro fee only applies only if the trader has sufficient funds in the account. Traders simply need to log in to their accounts periodically to avoid these fees. eToro charges a $25 fee for all withdrawals. The minimum withdrawal amount is $50. eToro also charges fees if customers want to convert the funds they withdraw into other currencies. Stocks and ETFs– Most stocks and all ETFs have a minimum spread of 0.24%, although some higher-priced stocks have a minimum dollar amount as a spread. Overnight eToro fees vary by security. *These figures are an indication only and you should consult the eToro website for up-to-date spreads. Spreads are variable. eToro serves more than 60 countries worldwide. The process of opening an account is largely the same in each jurisdiction. First, traders fill out a form with some basic information and create a username. You can only withdraw funds using the same method that you used to deposit them, and to the same account as previously used to deposit. A verified account in simple terms means you must complete your eToro profile by filling in your personal details; answering some economic questions and submitting documentation that meets eToro's requirements for anti-money laundering. The eToro platform is the most important feature that sets it apart from its competition. The broker created the eToro platform as an entirely web-based trading tool. The platform’s crisp graphics and easy-to-read screens make it a perfect tool for novice traders. However, the platform also incorporates many advanced features for more sophisticated traders. In 2010, eToro created OpenBooks, which was a social platform. OpenBooks offered CopyTrader, which allowed traders to copy the trades of other traders in its community. Recently, eToro integrated the WebTrader platform with OpenBooks, creating their new product which is a complete social trading platform. Signing up for eToro is easy. Customers set up a profile with their information. They then choose the “Trade for Real” option and are taken to a deposit screen. The screen informs them of minimum deposit requirements and method of deposit based on the country where they reside. The above chart is only an indication. The current market price can be found on the eToro platform. The above chart is only an indication. The current market price can be found on the eTor platform. The chart function allows the trader to customize the chart using over 60 popular studies and drawing tools including Bollinger bands, moving averages and oscillators among others. This screen allows the traders to set the size of the trade, the leverage on the trade, and a stop/loss to mitigate risk and a take profit to lock in profits. In addition, traders can decide if they want to hold a trade over the weekend. 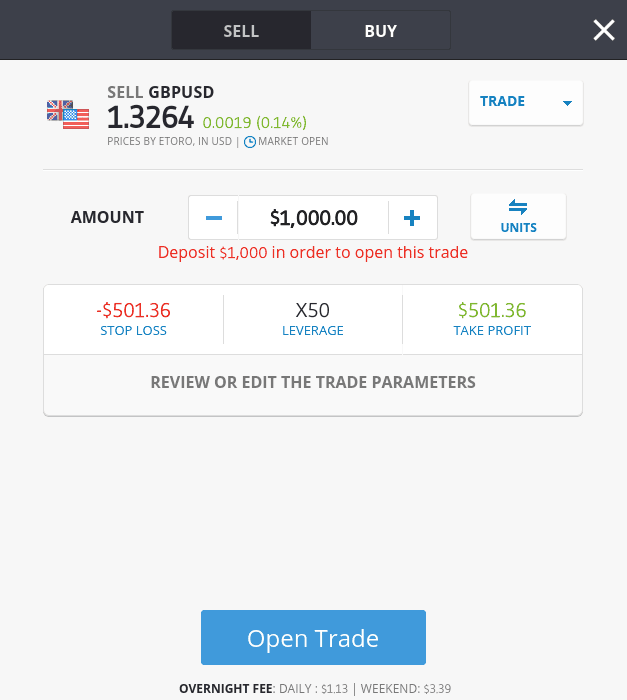 The large blue open trade button allows the trader to execute the trade. Most of the features available in the trading screen are very similar to those available from other CFD brokers. The exception is the sentiment function, which is unique to eToro’s social platform (more on the social functions below). Another difference between eToro and other online platforms is the way the broker displays leverage on the buy screen. With most brokers, the trader sets the number of units, lots or shares for purchase and the broker calculates the leverage needed given the trader’s account balance. With eToro's platform, however, the trader sets the amount of capital and leverage and the broker calculates the number of units, lots or shares the trader can purchase. While this is not a disadvantage of eToro, it may be confusing to more experienced traders. Another shortcoming of the platform is that the first screen in the real trading application only shows some of the instruments available for trading. The drop-down menu shows currency pairs, indices, and commodities, but fails to list the CFDs for listed companies. To find these instruments, a trader must either use the menu under the Markets section or find them using the search function in the menu bar. However, a trader unfamiliar with equity markets may not know what stocks are available for trading. Most other CFD brokers make it easier to find lists of securities available for trading. 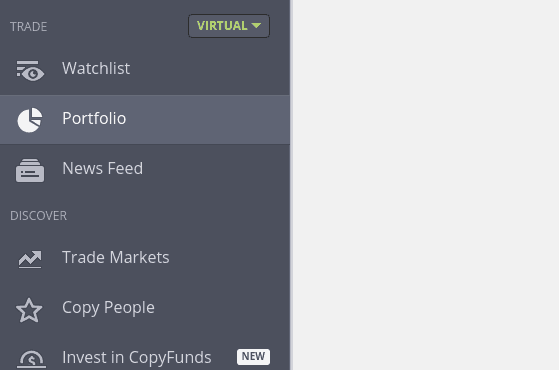 The People Discovery section of eToro is where the platform really stands out from its competitors. This section allows the trader to screen for different traders on the platform using country of origin, markets traded, percentage gains and time frame. Traders can also screen by the risk profile of the trader and whether the results have been verified. Traders on the platform can also use a social feature called Copy People. They can click on a trader they want to copy, set a copy amount for trading and begin copying the trades made by that individual. With this feature, a trader can copy every feature of a trader including the opening of new trades, managing stop-loss orders and closing positions. Other features of the eToro platform include Top Trader Insights, which collects data from the top 100 traders on the platform. eToro also provides an economic calendar and market news. The eToro demo account looks identical to the eToro standard account. The only difference is that traders start with a $100,000 balance in virtual funds. To access the demo account, the trader logs into the account. Next, the trader clicks virtual portfolio and confirms the selection. In addition to the demo mode, novice traders have access to other resources to help them learn how to trade. eToro has a section on its platform called Trading Academy, which contains educational resources. Trading Academy offers webinars on how to maximize success on the eToro platform and an education center with eCourses and training videos. Trading Academy also offers a section with tips for new traders. 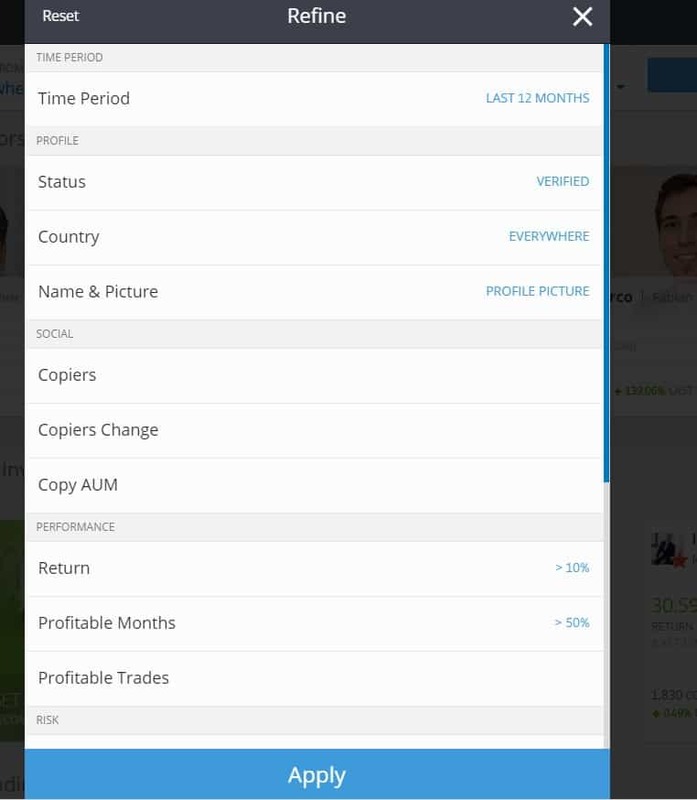 One of the main advantages of signing up with eToro is that traders can integrate social features into their trading. We broke down in greater detail how these features work. Your account will be opened with the existing open positions at the market rates at the time of copying – not the rates the Copied Trader opened the original trades. Your trades will have the original trade's stop loss (SL) and take profit (TP). Your trades will mirror the future actions of the Copied Trader. This includes SL and TP as well as closing of the trade as soon you begin to copy them. Closing a specific copied trade won't close your entire copy account. Should a position be opened in a market that's closed at the time of copying (e.g. a market break), a Market Order will be opened by the system for the Copier. As soon as the market opens, an order is executed into a position with the first market rate. If you wish to see all of the trades you've copied from one trader, simply go to your portfolio and click on the name of the Copied Trader. People From: Traders can choose a country from a dropdown list or they can pick “Everywhere.” The platform then returns a list of traders from the country or countries. Who Invest In: You can filter by “Any Market” or choose a specific asset class (i.e. currencies, commodities, indices, stocks, ETFs or Cryptocurrencies). eToro also has a more advanced trading filter page for traders who want more control over whom they follow. Status: Traders can choose to follow only traders who have verified their accounts with eToro as well as only traders who are part of the Popular Investor Program (see below). 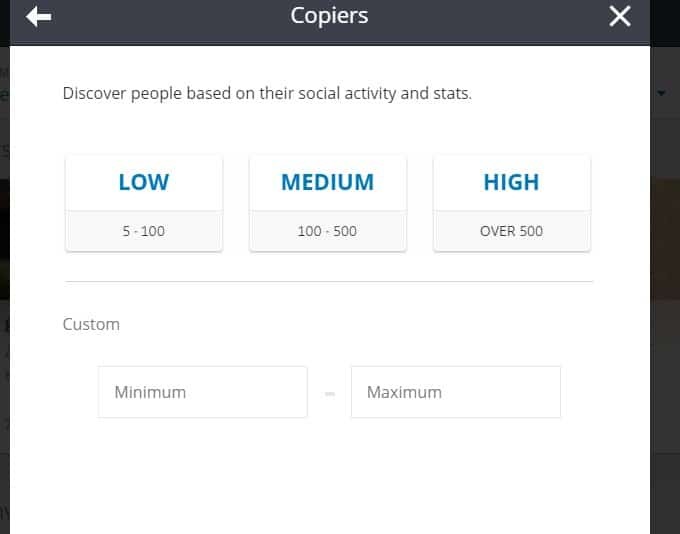 Copiers Change: The percentage change in the number of people following the copied trader. Copy AUM: The total assets under management of the copied trader. With this feature, you can choose, for example, to follow only traders with assets in their account over a certain amount. Performance: With these filters, you can choose to follow traders based on the returns of their account, their percentage of profitable trading months or their percentage of profitable trades. Risk Score: eToro assigns a risk score to each portfolio, which is an indicator of how exposed the portfolio is to market volatility. You can filter by risk score to gauge how much volatility to expect from following a particular trader. Portfolio: A filter for following based on a trader’s allocation or average trade size. Activity: A filter for following based on how active a trader is in the market. eToro has a Popular Investor Program, which has four levels: Cadet, Rising Star, Champion and Elite. Each level has its own requirements and benefits. In order to apply for the Popular Investor Program, traders must verify their account with eToro. When trades are copied by other people, an eToro Popular Investor can earn up to 2% of their annual assets under management (AUM) and fixed payments. These payments are added to any other profits you make. Essentially, eToro pays you if you have traders follow you and copy your trades. Important: CFDs are complex instruments and come with a high risk of losing money rapidly due to leverage. 76% of retail trader accounts lose money when trading CFDs with this provider. You should consider whether you understand how CFDs work and whether you can afford to take the high risk of losing your money.